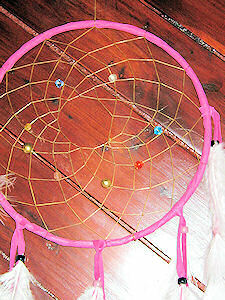 This dreamcatcher has glass beads in the web in a variety of colors. Hand crafted in the USA. The picture shown is the 9" size. It is representative, the one you receive may vary slightly. It is available in a variety of leather colors and feather choices (shown in hot pink buckskin with White Turkey feathers). Additional large feathers can be added to each fringe for an additional charge. The feathers are held on with glass crow beads (cheyenne pink and black shown). If you have a preference for particular crow bead colors, leave a comment in the comment box of your checkout form. We have all the colors shown in our Crow Beads craft section. The 7" size has six fringes and the 9", 12" and 15" size has ten. The Dream Catcher Legend The dream catcher comes from an Ojibwe legend. According to the legend, hanging a dream catcher near a sleeping person causes the bad dreams to be caught in the web, while the good dreams enter through the hole in the middle and drift down the feathers to the sleeping person. Then in the morning, sunlight enters through the hole to melt the bad dreams away. Read the Ojibway dreamcatcher legend. This dreamcatcher can be shipped internationally. However, check to be sure feathers can be imported to your country. We are not responsible for items seized by customs. Outside the US, there is an additional $90 inspection fee to ship PHEASANT FEATHERS, so if you are outside the US, you might want to order turkey, duck or chicken feathers, which don't require inspection. Feathers of any kind cannot be shipped to New Zealand, however, we can send a dreamcatcher without the feathers. AND your order is going to the continental US, you can use this coupon to save $5.00 on postage. 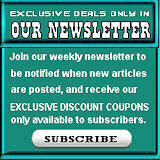 Current Reviews: 1 This product was added to our catalog on 06/22/2009. I received my custom dream catcher today, and it is gorgeous ..